Winner Blue Ridge Parkway Vistas category. I didn’t enter any photos in this year’s Appalachian Mountain Photography Competition, but that doesn’t stop me at gawking at all the amazing photos in this year’s collection! You can see all the winners and finalists here. Our lovely invitations (once again designed by Rachelle Somma) invited our guests to “celebrate science, nature and love.” Keeping with the nature and science theme, Ryan and I selected Monty Python’s “The Galaxy Song” for our first dance. Once we finally picked a song, it dawned on us that we were actually going to have to dance to said song. 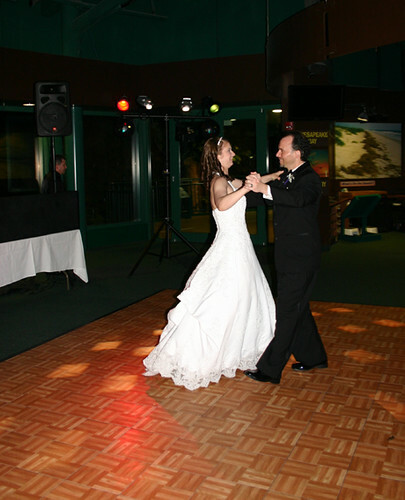 One morning on a whim, I took a “Which Choreographed Wedding Dance Are You?” quiz on TheKnot.com. It suggested a simple waltz. “Simple” sounded nice! Alas, YouTube could only get us so far. As luck would have it, Ryan’s father is an avid ballroom dancer! With his connections, it was Marie Rants and Rants Ballroom Dance Company to the rescue! Exactly a week before the wedding, Marie snuck us in for a quick session. In just forty-five short minutes, she managed to make us presentable! With patience and encouragement and lots of reminders about not stepping on my dress, she taught Ryan and I just enough to moves keep our dance interesting, but not enough moves to overwhelm us. Ryan and his mother got some pointers too! After we left Marie’s guidance, it was up to me and Ryan to practice. We practiced in the kitchen while we waited for popcorn to pop. We practiced on our back porch while the dogs sniffed around the yard. The day of the wedding, we practiced in our hotel room while we waited for the hotel gym to be mopped. My favorite practice session was two days before the wedding. It was my 35th birthday and we went hiking at Merchant’s Millpond State Park. 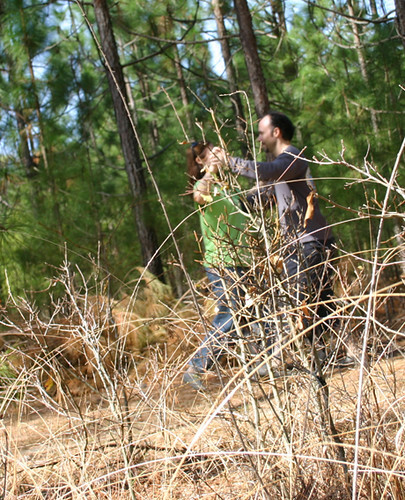 When the Lassiter Trail expanded into a wide, flat fireroad, we took advantage of the space. In that statement, I grossly underestimated the emotions of a wedding day…and how striking my new husband was going to look in a tuxedo! Although I was terrified walking up to the dance floor, when Ryan and I did the actual dance at the wedding, we were both surprised to find we were mostly unaware of the family and friends around us. Special special thanks to Ryan’s dad, Marie Rants and Rants Ballroom Dance Company for helping us out on such short notice! A couple of quick pictures to share today. 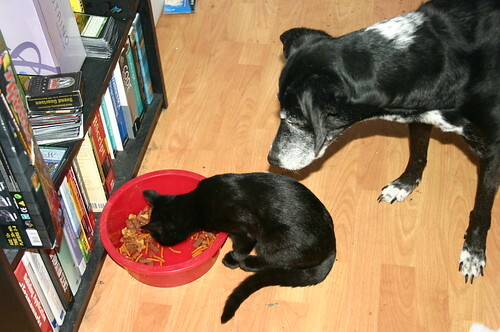 The kitten Qubit has taken a liking to dog food. 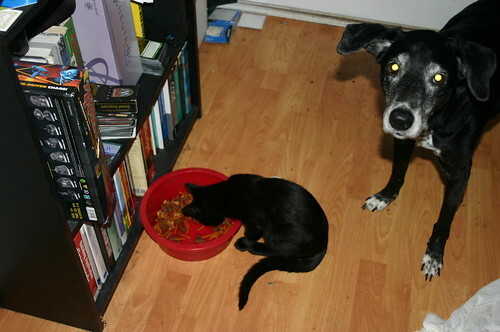 This morning, he rushed over to Jimmie’s bowl and started devouring Jimmie’s breakfast. Qubit has picked his victim well– Jimmie is exactly the pushover who just sits there and lets it happen. That kind of behavior would never fly with Henry. We had beautiful succulent-inspired invitations designed for us by Rachelle Somma. Originally when we were tackling table cards, I took her invitation design and simply numbered the tables… in binary. 0001, 0010, 0011, 0100, etc. I sent them over to Ryan for review. Then I heard something I never thought I would hear Ryan say. Ryan and Binary not getting along?!? This is a man who has binary on his license plate. Heck, this was a man who kept track of his Relay for Life laps in binary! With that, our tables went from one of his loves to one of mine! Ryan quickly found a website of public domain leaf silhouettes and he embarked on getting all the table cards ready in Photoshop. NOW…. I don’t think I’m a Bridezilla. At least not yet– I do have 10 more days to completely lose it. BUT I am very particular about trees. 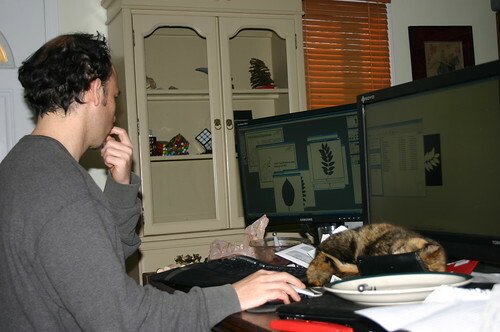 And there on the computer screen, this “Treezilla” spied some troubling leaves. Patient, patient Ryan gently reminded me, “Sweetie, they don’t all have to mean something.” and he was absolutely right. I sat back down. 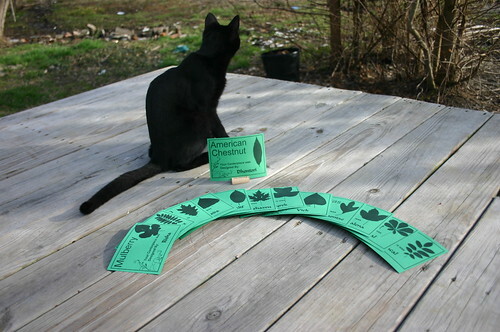 But when we decided we wanted to have an American Chestnut tree and we had to hand edit a leaf logo from the American Chestnut Foundation, that opened up the door for leaves that weren’t on the website! 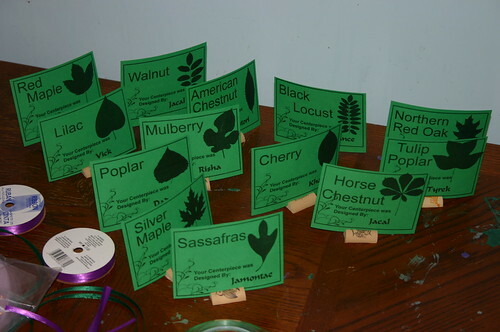 Along with American Chestnut, Tulip Poplar and Sassafras snuck in. When it was all said and done we had quite an array of table cards. Eleven trees and two bushes. With one exception I have personally seen each and every one of these leaves in the Commonwealth of Virginia. 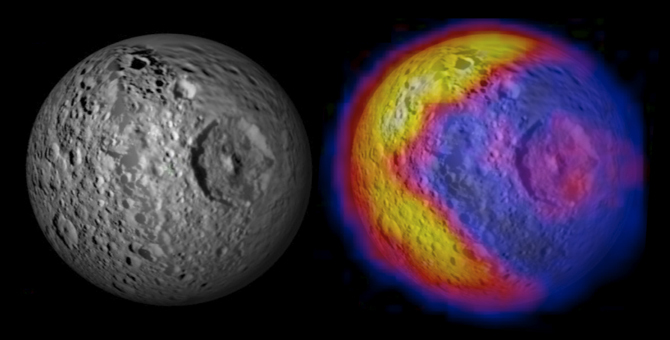 Ryan was right– they all didn’t have to mean something. But it just so happens with our three additions, I have a memory associated with each (which isn’t an especially unique property– there are a number of species I could say the same about). American Chestnut – a persistent species which after a century of defeats from the blight fungus continues to sprout again in hopes for better odds. This is a tree that reminds me of our birthdays. On Ryan’s 35th birthday, we stumbled on an American Chestnut bur on a hike. On my 34th birthday, we attended the planting of a blight resistant hybrid. Cherry – A cherry tree grew in my maternal grandmother’s yard. Each year we would tie plastic alligators and baby dolls to the branches in a futile effort to scare the birds away from the fruit. Tulip Poplar – My Great Uncle’s favorite tree because it grows fast and straight. My sister’s favorite because it is easy to identify. Mulberry – Ryan, my mother and I ran across Mulberry bushes together on a walk in Occoquan. The leaves are so oddly and uniquely patterned. I remember thinking at first that they were eaten by insects. Silver Maple – A tree that grew in the front yard of my home in Blacksburg. Red Maple – A tree I learned after moving to Elizabeth City. By seeing its spring flowers at Fun Junktion and its autumn leaves at Camden Causeway, I truly learned why it earned the distinction “red”. Lilac – A bush with such an amazing scent. A townhouse I lived in Blacksburg had a common area full of them. Their purply goodness was phenomenal each spring (and readily covered the usual scent of dog poo). Horse Chestnut – My Dad tried to trick me once into thinking a Horse Chestnut was an American Chestnut. It’s a common mistake even though the two trees aren’t even related. The tree Anne Frank peered at from her attic is also a Horse Chestnut. Ryan and I visited it in November 2008 when we were in Amsterdam. Sassafras – I found two turned Sassafras leaves on the backside of Dragon’s Tooth October 2005. One was burgundy. One was orange. They looked like little Hokie Bird tracks. Black Walnut – My childhood home had two enormous black walnut trees– one was home to our makeshift tire swing! Cottonwood (Poplar) – This one I hadn’t seen in Virginia. But I did see its brilliance last August in Wisconsin. My co-workers took me on a boat ride down the Mississippi River. The delicate, white seeds were everywhere. They floated like feathers and made the Mississippi seem magical. I wish I could say I let Cottonwood make the cut because of my Mississippi River memory. But really it was because I was waaaaaay too lazy to make a Sycamore leaf into a silhouette. Have you seen all the points on those suckers?!? We printed out all our cards on green card stock. 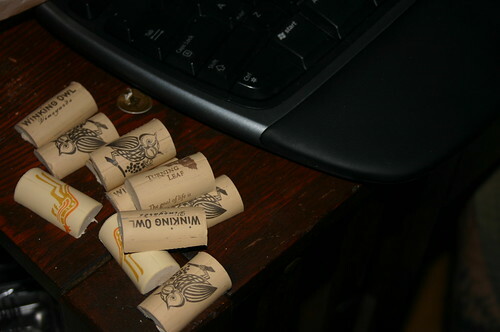 For stands, my immediate family had been diligently drinking wine and saving the corks for months. Using an idea we heard on NPR, Ryan sliced them in half with a box cutter and made a slit in the top. 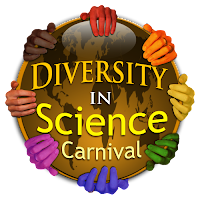 Two quick notes about blog carnivals that published recently. One hundred years ago today, my paternal grandfather, Gerard Ivanhoe (G.I. for short) was born! He passed away five years ago. He was a hardworking civil engineer and was involved with many of the bridges in Washington, D.C. He was active– playing tennis even as he started to lose his eyesight and could only make out yellow blurs. He wrote in diaries daily and he was a great story teller!!! Every time I visited him in his last year, I would prod him for stories to write down in my own journals. The thing that resonates the most with me right now about my grandfather is the love he had for my grandmother. 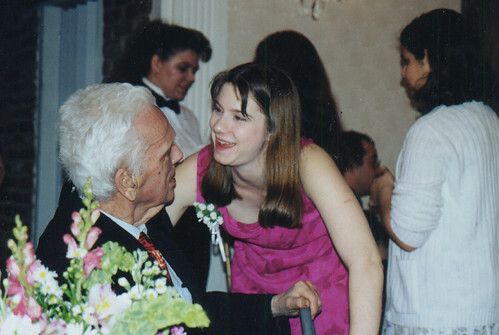 Since I was the smallest little girl, Grandpa always talked about his how Grandma was his “dream girl.” He told stories about all the hoops he had to jump through to get “properly introduced” so he could finally ask her out. Throughout my lifespan, he was always describing her as the most beautiful woman, even to strangers in the supermarket. His admiration for her did not stop at looks. He often speculated that Grandma would be the first Methodist to be canonized by the Catholic Church. The kind of love my grandfather exhibited– I had assumed it was a generational thing. It was a product of their time. It didn’t exist in my time. Men weren’t like that anymore. That ‘s that. I’m dating a man who works hard, a man who’s active, a man who loves to write. I hear tales over a decade old of how Ryan tried to impress me with hot wings and book signings. I wake up each and every morning to a compliment. And on those occasions when the term “dream girl” is used, I still get chills.